Like most other security cameras, this Ring Doorbell has 1080p video and infrared night vision. The motion detection zones are also fully configurable via the app. It operates either hardwired or battery-powered, and the battery pack is removable so you don't have to take the whole thing off the wall to recharge it. 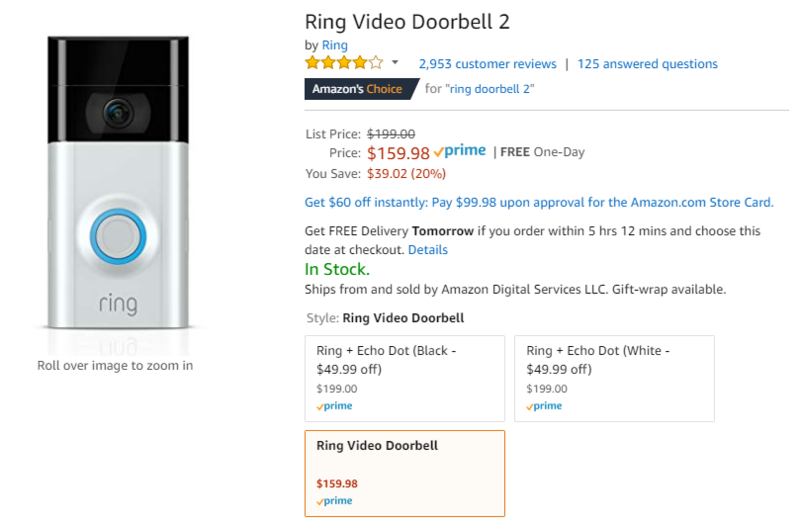 The Ring Video Doorbell 2 works with Alexa services, which is no surprise considering Amazon owns Ring these days. It also works with Assistant, but it's not as deeply integrated as Alexa. We've seen the Ring 2 dip as low as $155 lately, but that was a refurbished device. This one is new and just a few bucks more. It's a solid purchase if you're not already heavily invested in another camera ecosystem.